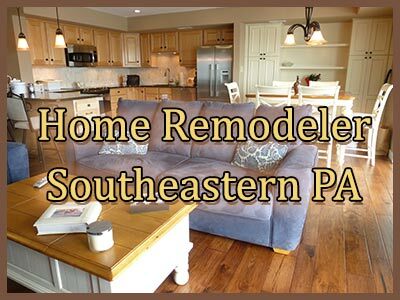 Tom Thornton of Tri-County General Contracting has been building, renovating and beautifying homes as a home remodeling contractor Southeastern PA for decades. Over four decades to be exact. Tom has been completing projects from small renovations and repairs to multi-million dollar custom homes. We have plenty of satisfied testimonials from our loyal clients in Southeastern PA.
Quality workmanship and customer satisfaction is always our first priority. As a company, we have never wanted to grow so big as to no longer be able to give our clients hands-on and individually tailored customer service. As a home remodeling contractor, the first step in giving our customers a truly satisfactory renovation experience is providing an honest and competitive cost estimate. We hate hearing about competitors low ball estimates that have left clients with half started projects. Our change orders always come from are customers add-ons; never from bad estimating. Years of experience allow us to give our customers real schedules and competitive pricing. Tom himself is always available to answer any questions our clients may have along the way. But don’t just take our word for it, read over the heaps of satisfied customer testimonials here! In many cases, remodeling contractors have a harder job than new home builders. Tom understands the structural integrity of your home and works to improve the space while keeping in-line with building codes and limitations of the original structure. Rest assured that Tom and his team at Tri-County General Contracting are experts in working with established structures and work tirelessly with homeowners, crafting the home of their dreams. We promise to keep your home as clean and functional as possible throughout the entire renovation process, and are open to all concerns and suggestions of every client we work with. Would you like to view some photos of Tri-County General Contracting’s past home remodels? Explore our site’s collection of basement, kitchen, bathroom and deck and flooring pics. We’ve been in business for a long time now, and we have worked hard to earn our 100 percent customer satisfaction record. So give Tom a call today, get the wheels turning on the remodel of your dreams and become another satisfied client!